Knowledge exchange is a buzz-phrase in psychology, but remains elusive and difficult to achieve. Amid widespread distrust of ‘experts’ and systematic attempts to undermine the very concept of truth, ensuring effective communication between professionals and the communities they serve is more important than ever. What is knowledge exchange? Different people will give you different answers, but to me it’s a subtype of the broader concept of public engagement – which covers all sorts of conversations and ways to share information with people outside your professional specialism. Much of public engagement can be categorised as science communication. This is very much a one-way street – scientists telling the public about what they do, what they’ve found, what it means. Knowledge exchange is somewhat different. It involves the transfer of information between two partners with separate but complementary expertise. For example, recently I delivered a couple of workshops on technology and autism, working with autistic people and their allies. This was a knowledge exchange scenario, and so instead of my telling them how to approach the technology, we worked together to build shared knowledge drawing on my research evidence and their personal and practical experiences. It is fairly easy to see how knowledge exchange plays a role in good psychological research. Positive partnerships with community members and organisations can help with recruitment to studies, and increase the likelihood of that holy grail – translation of findings into practice. And for my psychology colleagues in practice settings, knowledge exchange may seem to be happening already. After all, you come into direct contact with your constituents daily. However, I would argue that this type of contact does not meet the criteria for true knowledge exchange in one crucial way. To be effective, knowledge exchange should be a partnership between equals. Both parties must feel they have a voice and an influence on the outcome. In contrast, in the relationship between a practising psychologist and their clients, there is a fundamental imbalance of power, which I think all of us will have experienced for ourselves when interacting, for example, with medical professionals or experts in the financial services. Have you ever felt foolish or out of your depth as the discussion is infiltrated by complex jargon? Have you found yourself going along with recommended actions, slightly unsure as to how you got there? Have you gone home after an appointment with a list of questions you realise you somehow failed to ask? Knowledge exchange then, should be viewed as essential to any psychologist, whether working in a research or practice setting. And not just as a way to achieve specific goals, like more effective recruitment or better relationships with clients. Knowledge exchange is a matter of fundamental principle going to the heart of what we imagine our science to be. If psychology is the pursuit of understanding of the human mind and behaviour, if we want somehow to capture multitudinous human diversity, then that diversity needs to be represented at the core of our practice and research. If I have convinced you that knowledge exchange is an essential requirement for a modern psychologist, what next? Over the last two years I have been directly addressing this question, in the context of autism research and practice, in partnership with autistic scholars, advocates and community leaders, and their non-autistic allies. The Shaping Autism Research seminar series brought together all of these people with academics and practitioners, not just from psychology but also from other relevant disciplines, as well as from the third sector. Together we have considered how the UK research context can change to better meet the needs of autistic people. Building participatory research and practice frameworks has emerged as the key recommendation from the series. In my own research group, the Patrick Wild Centre at the University of Edinburgh, we have tried out a couple of innovative ways to achieve effective partnership with our communities. During the Family in Residence project, over the course of a year we worked closely with a single family affected by fragile-X syndrome – a key focus of our research. 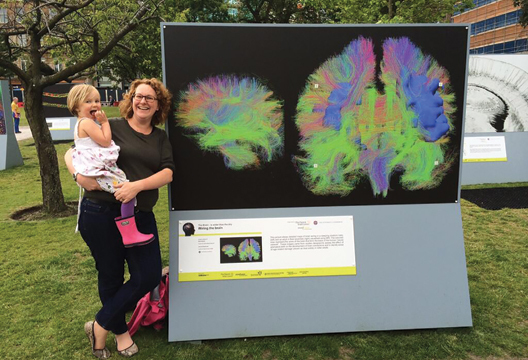 The McDonald family were welcomed into our team and, over a series of visits both at the university and in their home, we built up a detailed understanding of their personal experiences and how this could influence our research. In one particularly informative exercise, we asked the family to review a series of standard measures and assessment tools commonly used in research and clinical practice. The boys (Stuart and Matthew, twins both with fragile-X syndrome) were largely positive about the Autism Diagnosis Observation Schedule tasks they tried out, which was very good news. But parents Gillian and Craig had a lot to say about the parent-report measures we frequently circulate, pointing out ambiguous items, and revealing the often harrowing subjective experience of answering questions about your child’s ‘deficits’ or ‘behaviours’. More recently, I was also fortunate to identify an autistic mentor. Kabie Brook is an Autistic Advocate, mother to a neurodiverse family, and leader in her community, not least as co-founder of Autism Rights Group Highland. Kabie and I had met many times at autism-related events in Scotland and beyond. This link was formalised a little more when she and I co-hosted a seminar (the first in the Shaping Autism Research series mentioned above), and the next logical step was to ask her to become my mentor. Just like any mentor, Kabie provides general oversight of all my professional activities, and guidance on these from her experienced perspective. Crucially, this relationship differs from what I’ve done previously in terms of engagement, which is to ask autistic people (or, where appropriate, other stakeholders such as parents of autistic children) for advice about a specific project at a specific point. The problem with this approach is that it leaves all the power in my hands – I decide what to ask, and when to ask it. The input of the autistic adviser is limited by my control over the situation, and the content I choose to share. With Kabie, we are working to give her total access to all my work (tricky, because there are a lot of different projects and ideas on the go) so that I can ask her about what I think is important, but she can also probe anything that catches her eye. • Engage with social media – have a website, blog, Facebook or Twitter account. For instance, before you begin a study, or adopt a new therapeutic approach, you might put up a poll on Twitter asking members of the community what they think about it. • Integrate feedback into your practice or data collection – ask your clients/participants how they felt about their experience of taking part (e.g. Did they enjoy participating? Did they feel comfortable?). • Create accessible summaries of your work and share them online. • Develop links by volunteering with local community organisations, or attending events led by people outside your profession – such as parent networks. • Be alert to and seize opportunities to build personal relationships with community members. Effective knowledge exchange should be a fundamental part of our work as psychologists. We are privileged in our education and each of us has, in our own small way, a leadership role in our community and a platform from which to speak. It is our responsibility to ensure that we use that role to achieve the best possible outcomes for those who are invested in our work, especially when they are vulnerable in some way. Equal partnerships with stakeholders can give us confidence that what we are doing is aligned with their priorities – helping to ensure we genuinely deliver on people’s best interests. More than that, in the current political situation, effective communication between the scientific ‘elite’ and the general population can restore trust in expertise and develop confidence in the evidence on which we must base practice and policy.